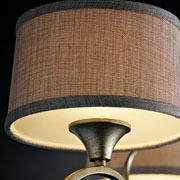 Lamps are one of the most versatile types of lights we offer in our lighting showroom. 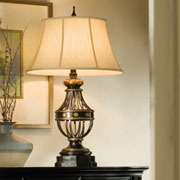 Are you shopping for decorative and affordable lamps for your bedroom, family room or dining room? At M&M Lighting in Houston, we carry an extensive selection of high-quality lamps to help improve the lighting and design of your interior decor. Whether you’re shopping for the perfect table lamp to display on your bedroom nightstand, a desk lamp to illuminate your office space, a floor lamp for your family room, or a candlestick lamp for the dining room, we’re confident you’ll find what you need in our lighting showroom. When it comes to lighting, we know what we’re doing. Our business was established more than 50 years ago, and our goal is to connect individuals in the Houston community with their perfect lighting solutions — residential or commercial. Browse our lighting catalog online or stop by our showroom to browse our large array of lighting options! Lamps are a great choice for task lighting as well as accent lighting. 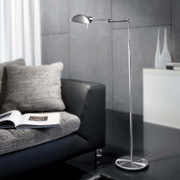 You can find a lamp that will help you read and accomplish your day-to-day tasks, but you can also choose lamps that are purely decorative and add a sense of elegance and sophistication to a room. 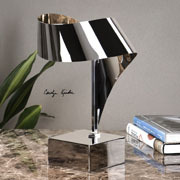 Table lamps: These can jazz up any of the empty tables in your home. 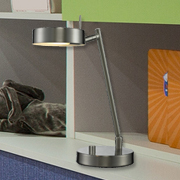 Desk lamps: Ideal for illuminating a specific area of your desk. 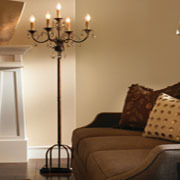 Accent lamps: Add a sense of flair to any room you place them in. Pharmacy table lamps: Specifically designed to shine a bright light on a table or desk, making it easier to read documents or see as you’re writing something down. 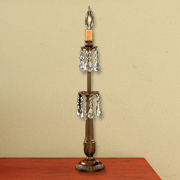 Candlestick lamps: Decorative and elegant to add a soft glow to a room. 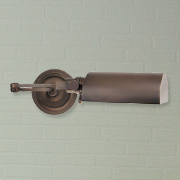 Pharmacy wall lamps: Task lighting that is installed onto your wall. Perfect for saving table space. 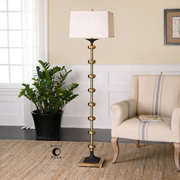 Floor lamps: Your standard lamp that can be placed on the floor. Pharmacy floor lamps: Designed to illuminate a specific area of a room. Torchieres: Lamps that are unique to spruce up the design of a room. 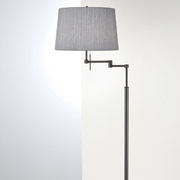 Swing arm floor lamp: A floor lamp with a lighting head that can be adjusted. 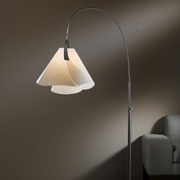 Arc lamp: A beautifully designed type of lamp that features a slight curve . 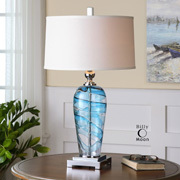 Art glass lamps: Lamps that feature artwork on their glass. 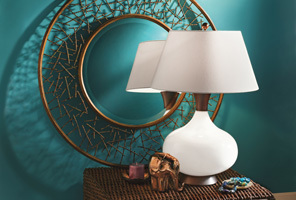 Transitional lamps: Lamps with a contemporary twist. Traditional lamps: Versatile lamps that have always looked classic in any room. 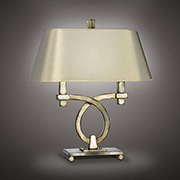 Whatever your style might be, we have a lamp that will fit it. Not sure what type of lamp will look best in your home? Consult one of our lighting experts today. 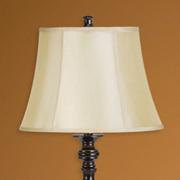 On top of our impressive selection of lamps, we also offer lampshades, such as bell lamp shades and drum lamp shades. Lampshades are great for dimming the overall lighting of a lamp — perfect for when you’re trying to add a soft glow to a room. Measure the space where the lampshade will go, and choose a lampshade that will fit within that space. As a general rule of thumb, the height of your desired lampshade should be about three-quarters of the height of the lamp base. Its width should be about the same measurement as the lamp base. When in doubt, go larger. Choose a lampshade material that will help you achieve your lighting intention. Lampshades are made of different materials in order to provide customers with a variety of choices, depending on their lighting goal and design. A heavier material will dim the room more than a lighter one will. Determine what color and design you want the lampshade to be. This all boils down to your personal style and design preference. Keep in mind that less light will shine through when you choose a darker color. Mix and match your lampshades and bases. Luckily, lampshades aren’t a permanent installation. If you choose a lampshade you grow tired of, you can always replace it with a new one! 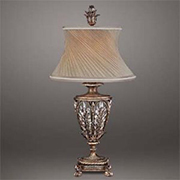 Ready to find lamp bases and lampshades for the rooms in your home or office? Browse our selection at our lighting showroom today. 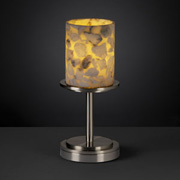 We know our lamps here at M&M Lighting. Between our knowledgeable lighting specialists who offer excellent customer service and our lighting products from high-quality brands, such as Robert Abbey, Dimond and Visual Comfort, we’re sure you’ll find lamps you love here in our lighting showroom. If you need help finding lighting solutions for your home or office, don’t hesitate to reach out to our team of lighting consultants at M&M Lighting. Schedule an appointment today. You can also follow our blog for more information and articles relating to lighting products and lighting solutions.